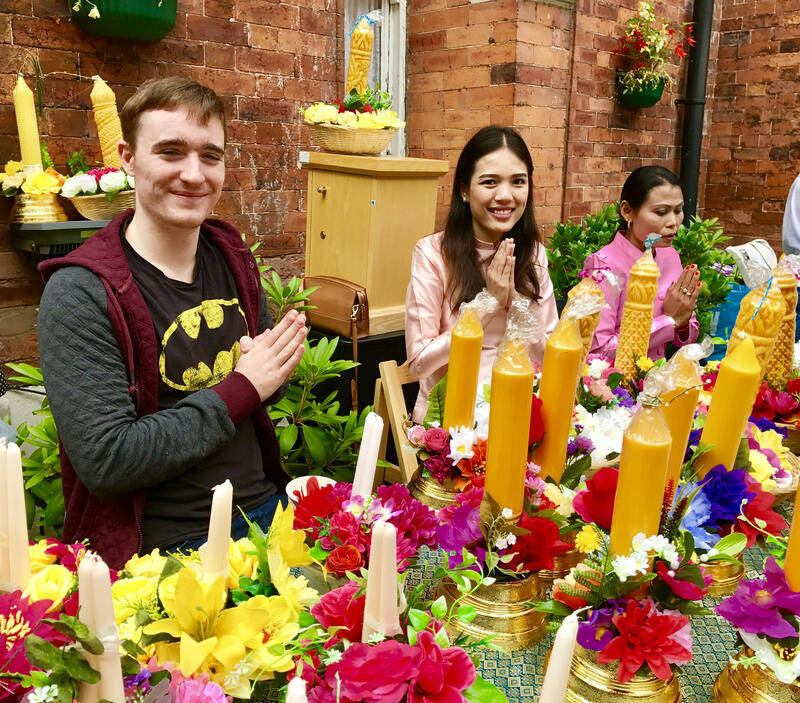 Vassa Ceremony Thai Candles Celebration:I am lucky enough to join the Vassa ceremony at Wat Buddharam, Thai temple in Leeds. Vassa (Pun-sa in Thai pronunciation) is often called the “Rain Retreat or Buddhist Lent”. 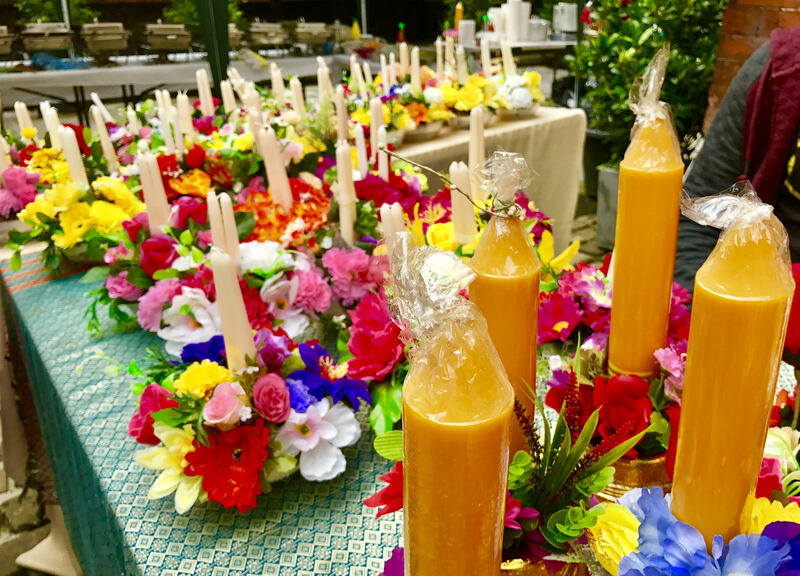 Vassa is such a special time for many Buddhists and Thai farmers. The monastics, monks or nuns will remain in one place; intensely studying Buddhism and meditation. In which, it will allow the farmers to concentrate on their works and reduce the frequency that the monks stepping on their growing crops. As soon as I stepped into Wat Buddharam, Leeds. I can feel the sense of serenity, although many people are attending today’s festival. Everyone makes me feel so welcome. Khun Nok, one of the organisers said: “Sawadee ka” which means “Hello” in Thai. Then she asked “I hope you haven’t had anything to eat yet, we are about to have some lunch soon” Is this the best greeting ever? 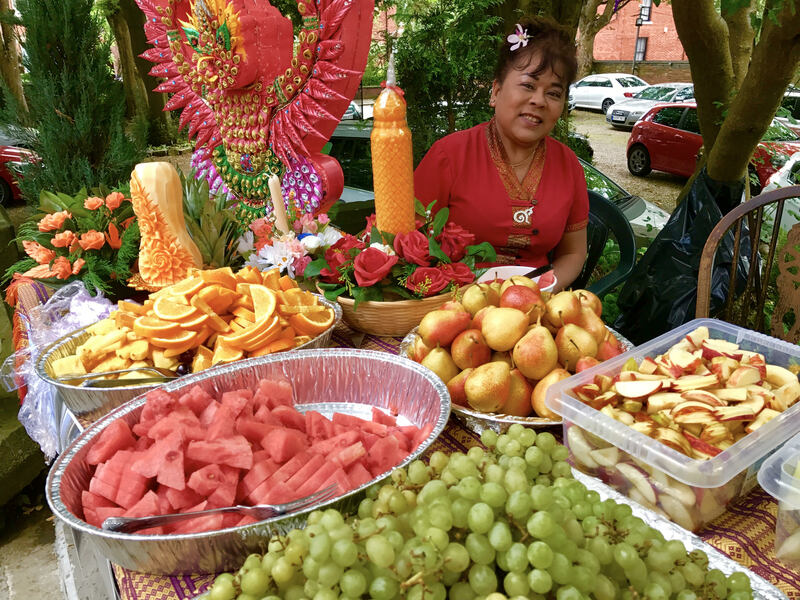 The wonderful hand carving fruits and vegetables, which were delicately made by Khun Nang. She also made the Garuda statue as part of the decoration for the Vassa ceremony. The colour is so vibrant like an explosion of happiness. I walk around and realise that almost everyone has got the decorated carved candles in their hands for this celebration. Ven Napan Santibhaddo Thawornbanjob enlightens me that in the olden days, the lay people offered the candles to the monk, which allowed them to read and study Buddhism at night. The monk will then pass on this important knowledge to others, providing wisdom back to the community. It is also the sign of the shining happiness in our life. My train of thought is stopped by an influx of ladies who are starting to form a line and give their alms *to the monks. Some people might question this ritual. Ven Napan gives me an insightful explanation. If you look at this ritual as an exchange of kindness, the monks’ duties are to study Buddhism then pass on the knowledge and words of wisdom. The lay people offering the practical, essential basic needs to the monk. It is the body and mind working side by side and we are supporting each other at our best abilities. As some of you may know I am a Recipe developer. 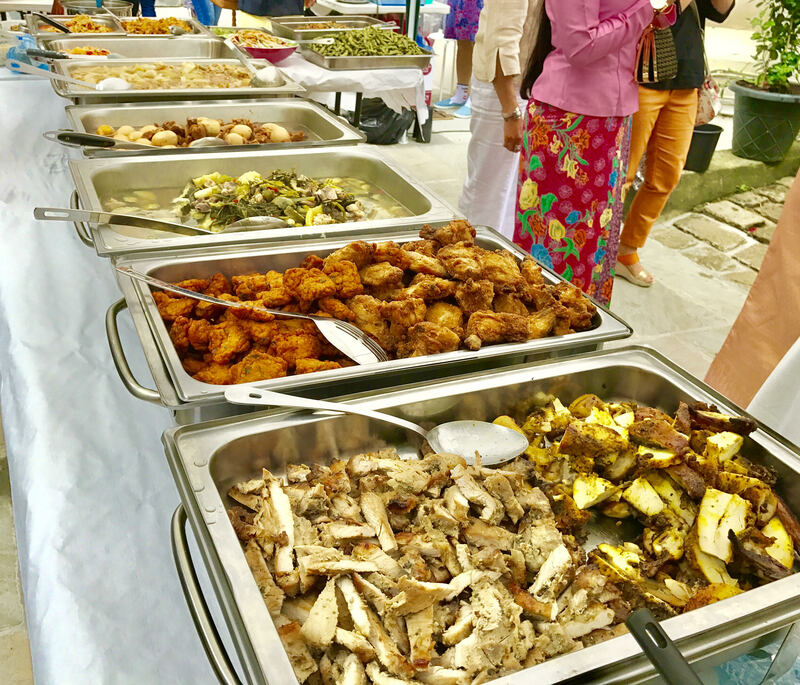 My highlight of this visit is the chance to taste an array of Traditional Thai dishes. Thai people love their food it is the way to show people how much we care for each other via the simplest form of giving. 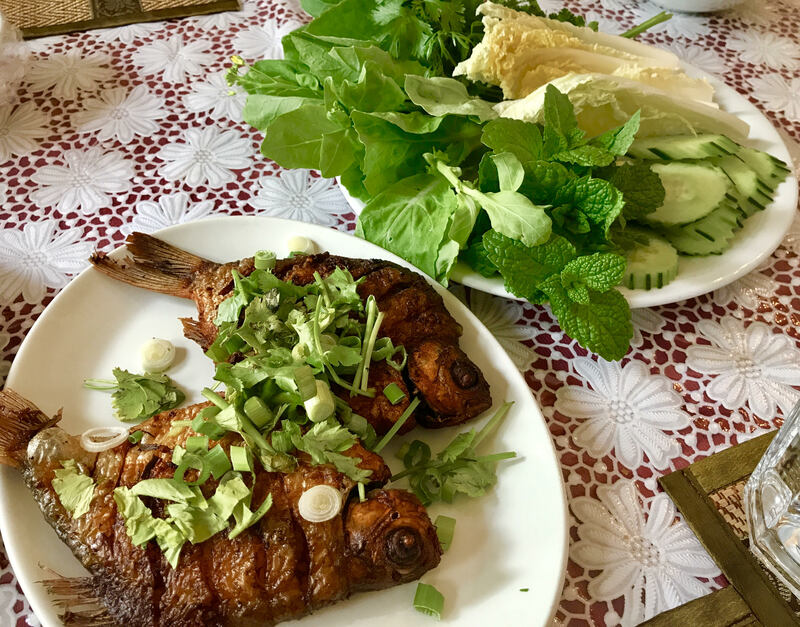 Today, I have seen a few tasty familiar dishes and they are very tasty too. While everyone is enjoying their food, I walk around and speak to a few visitors. Mr Haydn Whorton has been coming to the temple a long while. 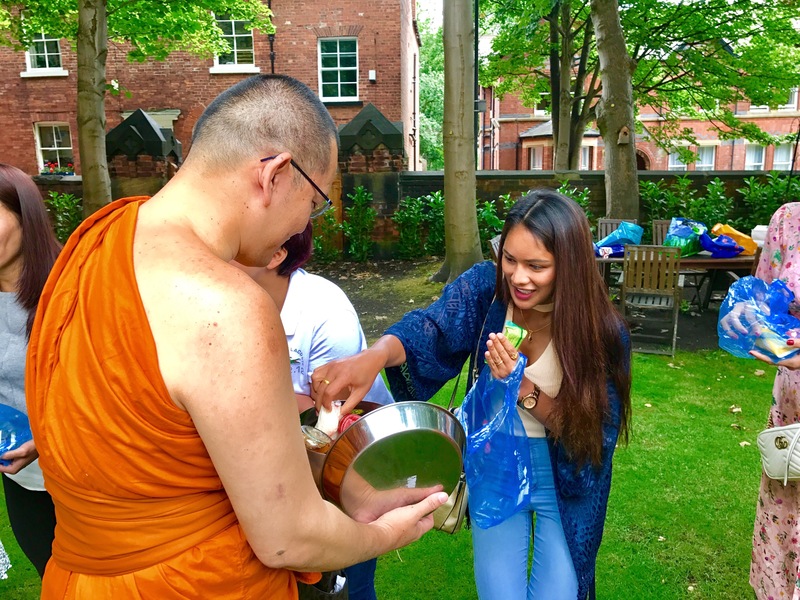 He is always interested in Buddhism and feels that Wat Buddharam Leeds fulfilled him spiritually and friendship. Mr Andrew Rainford one of the directors of Wat Buddharam Leeds explained that there are a lot of activities at the temple i.e. Thai Language and cultural study, Buddhism discussion with the monk, various celebrations. I also had a chance to speak to 3 University students Pan, Prim and James from Thailand. They explained how important it is to have a temple in Leeds. 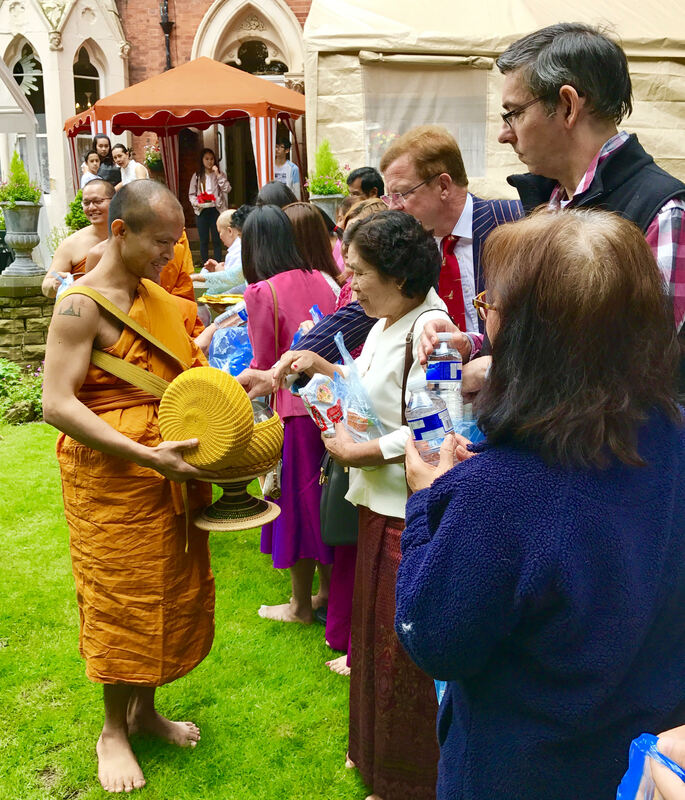 The Temple is not only a place that everybody can meet up for the religious reason but it also provides emotional and spiritual support to many Thais in the UK. The discussion had to stop because the Candle ceremony was about to start. The visitors hold their donated candles and walk around in a circle, full of happiness and with a big smile. It is wonderful to see people singing and celebrating the light of life and the new shining season to come. 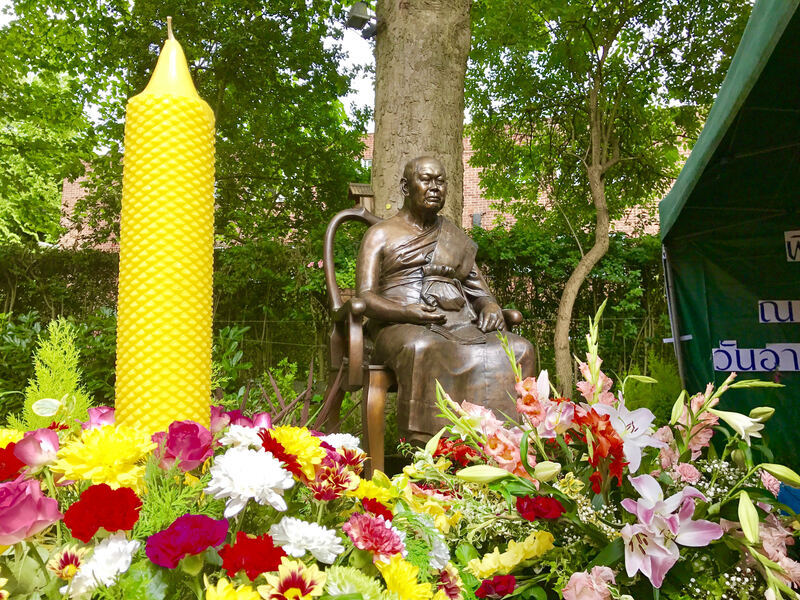 I was looking around at Vassa Ceremony Thai Candles Celebration and thinking of what Ven Napan explained to me about the purpose of the candles earlier. How do the little things create such a vast ripple effect? It does not matter who you are, how small you can be. We are a unique individual yet all connected to each other, somehow. A lovely description of the activities in Leeds. I had the privilege of being there on its first day of opening. I love my trips to the temple.